The patented SF800 is an all purpose flow meter with an excellent price-performance ratio. It is suitable for a wide range of applications and large variety of fluids, and covers flow velocities of 0.5 to 20 liter per minute at temperatures of -20 to +90 °C and an operating pressure of 16 bar (max 40 bar). The SF800 is entirely made of high-quality plastics and composites with great chemical and thermal resilience. The housing is made of PVDF, a high grade PVC, while the internal rotor of only 0.04 gram is made of Vectra, a liquid crystal polymer of very low weight. Both material are not susceptible to limescale. An integrated PCB emits the infrared signal, which is interrupted by the three blades of the rotor. SMD components transform the interrupted signal into a pulse. 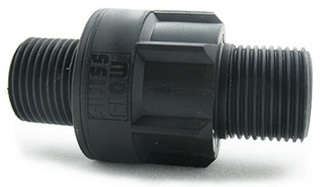 Because of the construction and geometry of the rotor housing, the Swissflow flow sensors can withstand high pressure. "What is currently missing is a reliable, accurate and affordable flow meter such as the SF800. The SF800 provides very little flow resistance and as such, is an ideal meter to use in a PC cooling system […..] to monitor flow rate and to provide an emergency shutdown (via a 3rd party software program) in the event of pump failure or coolant leak."